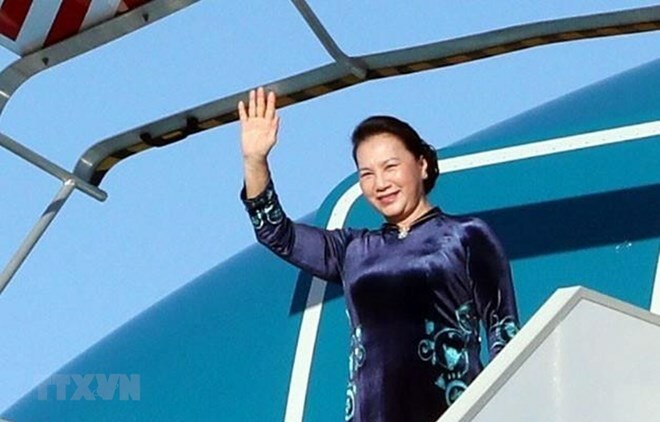 Brussels (VNA) – National Assembly Chairwoman Nguyen Thi Kim Ngan and her entourage arrived in the capital city of Brussels, Belgium on April 3, beginning their working trip to the European Parliament (EP) at the invitation of President Antonio Tajani. She was welcomed at the airport by Vietnamese Ambassador to Belgium Vu Anh Quang, Chairman of the Belgium – Vietnam Friendship Parliamentarians’ Group Georges Dallemagne, other Belgian officials and representatives of Vietnamese nationals living in the country. Vietnam and the European Union (EU) officially established their diplomatic ties on November 28, 1990. Later in 1996, the EU set up its representative mission in Hanoi. Ties between the Vietnamese NA and the EP have kept growing, becoming an important pillar in the Vietnam – EU comprehensive partnership. Regular visits, dialogues and exchanges between parliamentarians at multilateral forums have made active contributions to friendship and cooperation between Vietnam and the EU as well as their legislatures in particular. Both sides also established the Vietnam – EU and the EU – Vietnam friendship parliamentarians’ groups.